Ⅰ.Fujian Statistical Yearbook-2018 is an annual statistic publication of comprehensive information with highly density.The yearbook covers very comprehensive data in 2017 and some selected data series in important years of provincial and regional levels and in different departments,reflects various aspects of Fujian social and economic development. Ⅱ.The yearbook contains twenty chapters:1.General Survey;2.National Economy Accounting;3.Population,Employment and Wages;4.Investment in Fixed Assets;5.Foreign Trade;6.Energy;7.People’s Living Conditions;8.Price Indices;9.Finance;10.Agriculture;11.Industry;12.Construction;13.Transportation,Postal and Telecommunication Services;14.Wholesale,Retail Trades,Hotels,Catering Services and Tourism;15.Science and Education;16.Culture and Sports;17.Health;18.Publish Administration and Others;19.Enterprise Survey;20.Main Economic Indicators of City Prefecture and County etc.At the end of each chapter,Explanatory Notes on Main Statistical Indicators are included. Ⅲ.In comparison with the Fujian Statistical Yearbook 2017,following revisions have been made in this new version in terms of the statistical contents and in editing: 1.The order of the individual chapters have adjusted,General Survey increase the basic Unit of the Annual Report Legal Entity.2.Years mainly uniformed justment 2000,2005,2010,2016,2017 five years.3.According to the new situation of the annual report system changes,some statistical indexes of the text and the adjustment of the standard. Ⅳ.The data of Jinmen county are not included in this yearbook except for some additional notes on it. Ⅴ.Data source,calculation scope for important statistical data in this yearbook are noted in each chapter. Ⅵ.The units of measurement used in this yearbook are national standard measurement units. Ⅶ.The statistics data published in the past is re-verified in this book.Any discrepancy between the data of this book,it prevails. Ⅷ.As a result of the different unit choices,part of the total or relative data produce calculation error in The yearbook,we do not mechanical adjustment. Ⅸ.Notations used in the yearbook:”Blank Space” indicates absence or ignorance or insufficient decimal place of data indicator;“#” indicates a major breakdown of the total. Ⅹ.The indicator of production value in this yearbook is calculated according to prices of the year.Growth rate and indices of production value is calculated according to comparable prices. Ⅺ.Growth rates and indices in this yearbook are calculated by “level approach”. Ⅰ.Fujian Statistical Yearbook-2016 is an annual statistic publication of comprehensive information with highly density. 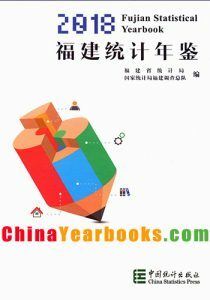 The yearbook covers very comprehensive data in 2015 and some selected data series in important years of provincial and regional levels and in different departments , reflects various aspects of Fujian social and economic development. Ⅱ.The yearbook contains twenty-two chapters: 1.General Survey；2.National Economy Accounting；3. Population,Employment and Wages；4.Investment in Fixed Assets；5 .Foreign Trade；6. Energy；7. People’s Living Conditions；8.Price Indices；9.General Survey of Cities；10.Finance；11.Agriculture；12.Industry； 13.Construction；14. Transportation, Postal and Telecommunication Services；15.Wholesale,Retail Trades, Hotels, Catering Services and Tourism；16.Science and Education；17.Culture and Sports；18.Health；19. Environment Protection；20.Publish Administration and Others；21. Enterprise Survey；22.Main Economic Indicators of City Prefecture and County etc. At the end of each chapter, Explanatory Notes on Main Statistical Indicators are included. 1.The order of the individual chapters have adjusted，General Survey increase the basic Unit of the Annual Report Legal Entity.2.Years mainly uniformed justment 2000,2005,2010,2014,2015 five years. 3. According to the new situation of the annual report system changes, some statistical indexes of the text and the adjustment of the standard. Ⅳ.The data of Jinmen county are not included in this yearbook except for some additional notes on it. Ⅴ.Data source, calculation scope for important statistical data in this yearbook are noted in each chapter. Ⅵ.The units of measurement used in this yearbook are national standard measurement units. Ⅶ. The statistics data published in the past is re-verified in this book. Any discrepancy between the data of this book, it prevails. Ⅷ. As a result of the different unit choices,part of the total or relative data produce calculation error in The yearbook,we do not mechanical adjustment. Ⅸ. Notations used in the yearbook: “Blank Space” indicates absence or ignorance or insufficient decimal place of data indicator; “#” indicates a major breakdown of the total. Ⅹ.The indicator of production value in this yearbook is calculated according to prices of the year. Growth rate and indices of production value is calculated according to comparable prices. Ⅺ.Growth rates and indices in this yearbook are calculated by “level approach”. Ⅰ.Fujian Statistical Yearbook-2014 is an annualstatistic publication of comprehensive information with highly density. 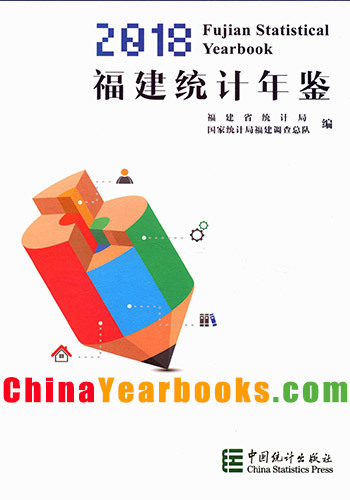 Theyearbook covers very comprehensive data in 2013 and some selected data seriesin important years of provincial and regional levels and in differentdepartments , reflects various aspects of Fujian social and economicdevelopment. Ⅱ.The yearbook contains twenty-two chapters: 1.GeneralSurvey；2.National Economy Accounting；3. Population,Employment and Wages；4.Investment in Fixed Assets；5 .Foreign Trade；6. Energy；7. People’s Living Conditions；8.Price Indices；9.GeneralSurvey of Cities；10.Finance；11.Agriculture；12.Industry；13.Construction；14. Transportation, Postal andTelecommunication Services；15.Wholesale,RetailTrades, Hotels, Catering Services and Tourism；16.Scienceand Education；17.Culture and Sports；18.Health；19.Environment Protection；20.Publish Administration and Others；21. Enterprise Survey；22.MainEconomic Indicators of City Prefecture and County etc. At the end of eachchapter, Explanatory Notes on Main Statistical Indicators are included. 1.The order of the individual chapters haveadjusted，General Survey increase the basic Unit of theAnnual Report Legal Entity.2.Years mainly uniformed adjustment2000,2005,2010,2012,2013 five years. 3. According to the new situation of theannual report system changes, some statistical indexes of the text and theadjustment of the standard. Ⅳ.The data of Jinmen county are not included in thisyearbook except for some additional notes on it. Ⅴ.Data source, calculation scope for importantstatistical data in this yearbook are noted in each chapter. Ⅵ.The units of measurement used in this yearbook arenational standard measurement units. Ⅶ. 2013 is the economic census year,It takes a periodof time to review Each major census data,So part of the data by Sector inChapters are the preliminary accounting number in 2013 and preliminary verifiednumber in 2012. Ⅷ. As a result of the different unit choices,part ofthe total or relative data produce calculation error in The yearbook,we do notmechanical adjustment. Ⅸ. Notations used in the yearbook: “Blank Space” indicatesabsence or ignorance or insufficient decimal place of data indicator; “#” indicates a majorbreakdown of the total. Ⅹ.The indicator of production value in this yearbook iscalculated according to prices of the year. Growth rate and indices ofproduction value is calculated according to comparable prices. Ⅺ.Growth rates and indices in this yearbook arecalculated by “level approach”.